•1 Table Top 6x8 Inches Approx. What's cuddly, black, and lovable? This cute cushion! This magnificent cute cushion is the ultimate sign of affection that they will not soon forget. It's cuddly, and cute, and the perfect way to say I Love You this Valentine's Day. 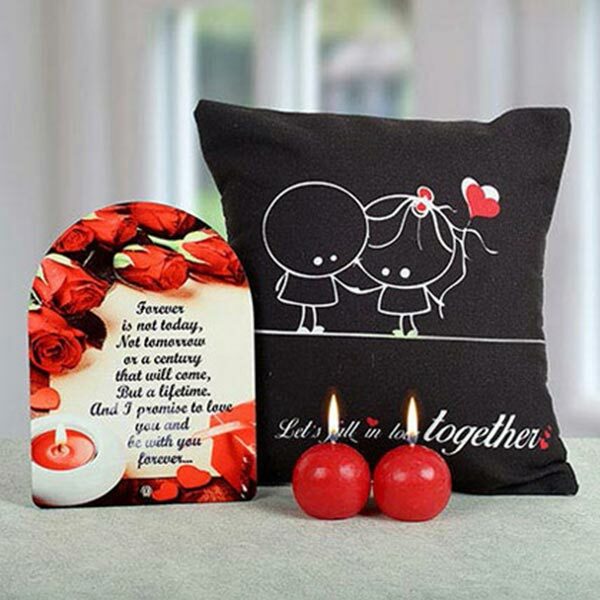 Make this a Valentine's Day they will cherish forever with this one of a kind cushion with 2 Red Ball Candles and 1 Table Top. Nice combination of gifts in this hamper. The cushion was extremely nice and soft. Delivery was also timely. All the best guys! Everything in the hamper is very nice. I loved cushion the most.